When you run your SureDesk™ you might see a program called Microsoft Lync 2010. MS Lync is an instant messaging program that integrates with Microsoft Office and is included in your SureDesk™ subscription. Microsoft Lync 2010 is a useful tool which allows employees communicate with each other easily. For example, instead of having to pick up a phone to ask a simple question you can send an instant message instead. This will save time for both the person asking the question and the person being asked. Microsoft Lync has many features which make it better than other messaging software. Integrated with other Microsoft Office programs so you can see whether other users are available, access your Outlook contacts and more. Keeps records of all chat communication. Can chat with users using other instant messaging programs. You can learn more about Microsoft Lync at the Microsoft website. Click on the gear icon in the upper right hand corner of the screen. 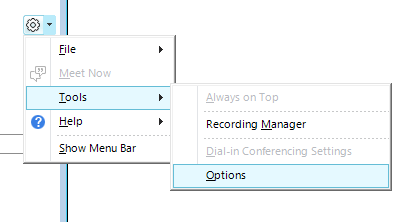 In the Personal section make sure Automatically start Lync when I log on to Windows is unchecked.